Basic movements were used for centuries to create sculpted bodies. 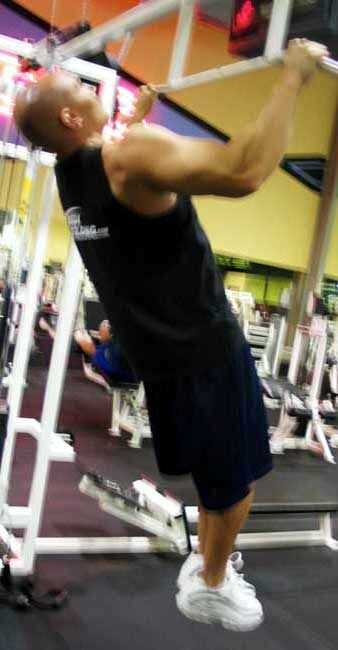 The chin up or pull up some people call it is one of those basic movements. Sometimes it is important to remember that being fit came way before barbells and fitness equipment. Basic movements were used for centuries to create sculpted bodies. 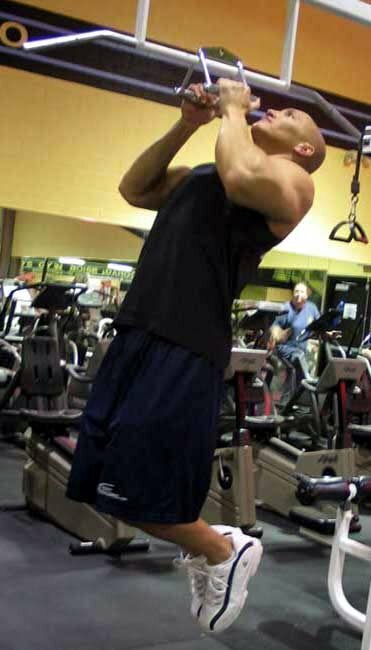 The chin up, or pull up some people call it, is one of those basic movements. 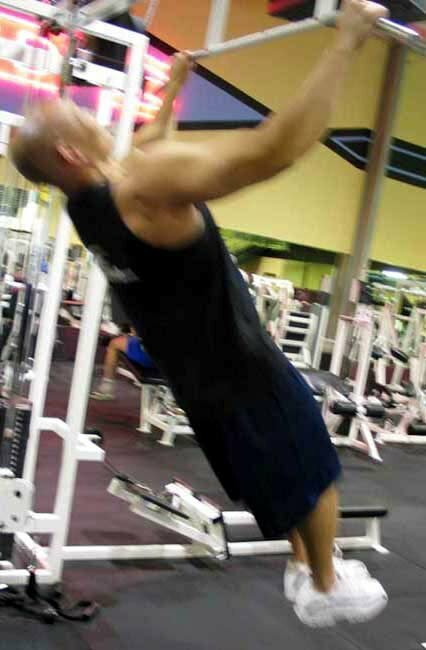 There is however a difference in chin-ups and pull-ups as well as several variations on the chin-up. Lets start with some basics. Supinated grip means palms facing your body. Pronated means palms facing away from your body. And semi-supinated means palms facing each other. 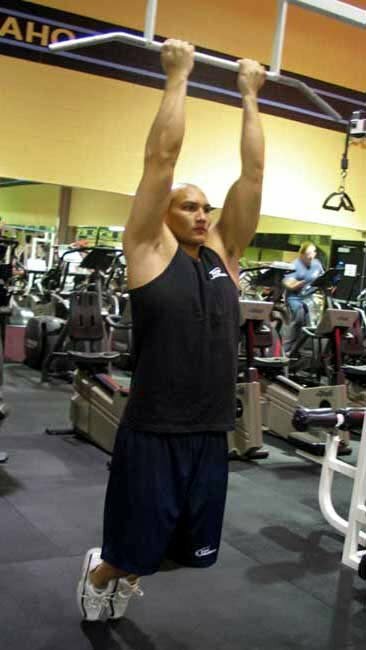 A pull-up uses a pronated grip, palms facing away from your body. 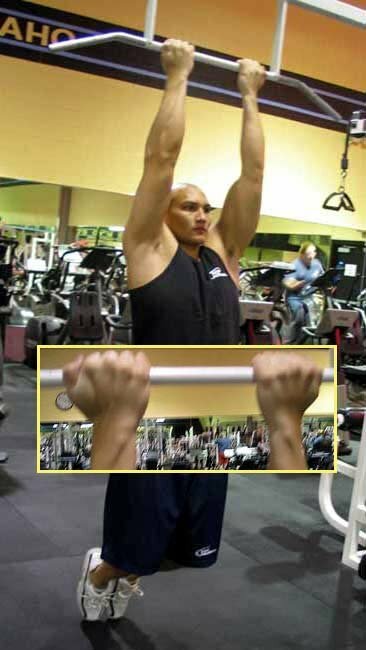 Chin-ups use the other two grips. The next section will describe eight variations on the chin-up. These variations should be used together to get full development of the back. Increased load on the elbow flexors and arms. Use a grip width of 4 to 6 inches between your little fingers. Advanced movement. Increased load on the rear delts. Use a semi-supinated grip. Some gyms may have a v handle that is set 6 to 8 inches apart. Bring your chest to handle as you pull yourself up. A spotter is a nice addition. This may be the strongest position for your elbow flexors. This grip will reduce the stress on your wrists, elbows and shoulders. Your hands should be semi-supinated and about 22 to 24 inches apart. This will recruit the most parts of the upper back. The advanced trainee should use this. Your hand position can be either pronated or supinated and vary in distance from narrow to shoulder width. The key is to keep your torso in a laid back position through out the entire movement. As you pull yourself to the bar you should keep your head back as far a possible and arch your spine bringing your sternum to the bar. Your legs will be at about a 45-degree angle to the floor. 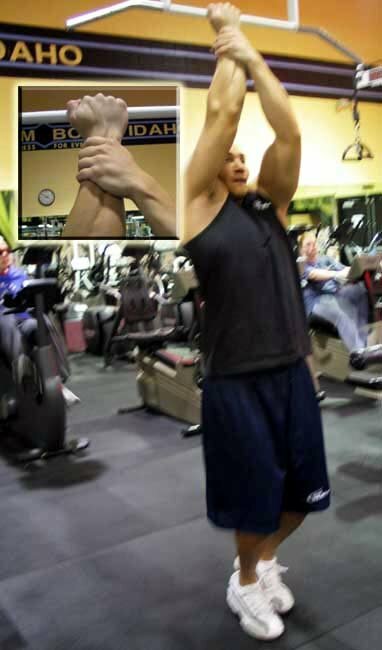 An additional note, a shoulder width grip will require more strength. Hands should be 4 to 6 inches apart. Increased load on the biceps. Also is easier on the wrists than the supinated grip. One hand pronated and one hand supinated. Alternate grip on each set. Increased load is on the supinated hand. 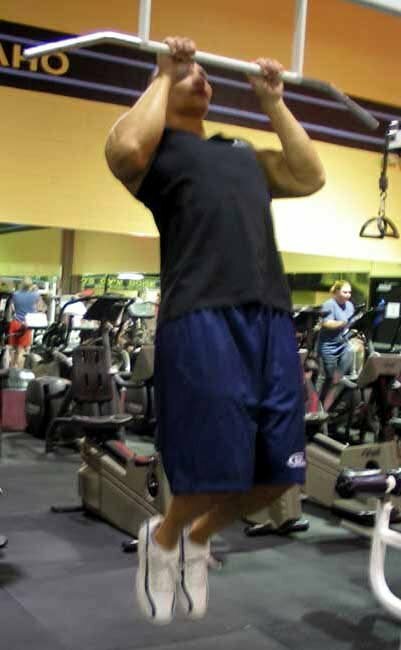 Use a wide grip, shoulder width or more. The wider the grip the more strength required. Advanced version. Use one hand in the supinated position and place the other hand on your wrist. This will allow you to only use arm to pull yourself up. Of course alternate hands so both arms get a work out. The subscapularis is the muscle under your shoulder blade and this is where you will feel the your back being worked. 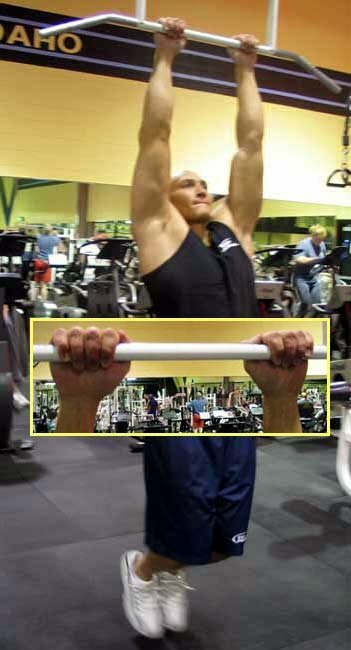 Use the wide-grip pull up position to start, when your chest reaches the bar push yourself away from the bar as you lower down to the starting position. You should remain under control at all times. No fast, jerky movements. Here are a couple of back routines. Both programs have prerequisites. 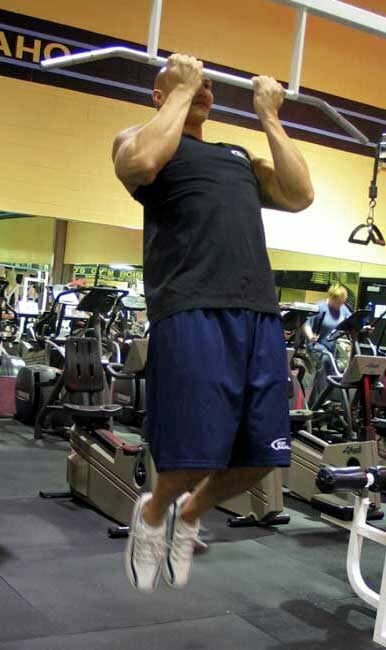 The first program requires that you can do at least 12 supinated grip chin-ups with strict form. 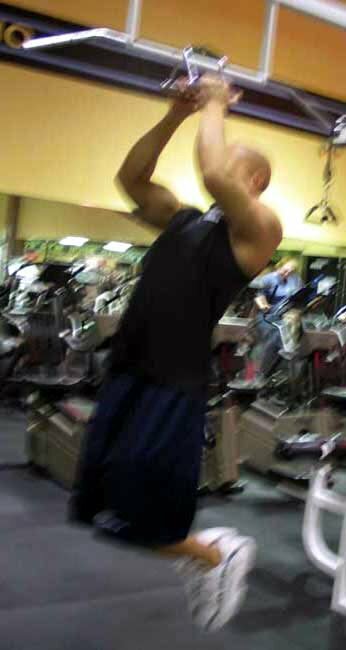 The second program prerequisite is that you can do at least 8 repetitions of a supinated grip chin-up with 33% additional weight. Start over. Do at least 2 sets, it will be hard to do any more. Click Here For A Printable Log Of Program 1. Click Here For A Printable Log Of Program 2. Christopher Phelps has been involved with recreational fitness and strength training for over 10 years. He utilizes his management background as a development tool to manage individual goal setting and success. He has written The Workout guide, which offers extensive fitness programs for all fitness levels.